Listen to eerie audio of humpbacks, bowheads and other whales singing in their natural habitats. April 4, 2018, 11:50 a.m.
Whales were in dire straits in the 1960s, reduced to a shadow of their former glory by more than a century of overzealous hunting. Ancient mammals that had overseen Earth's oceans for 50 million years were at the brink of extinction, nearly wiped out in a few generations by humans with harpoons. But then we heard them sing. The 1967 discovery of humpback whale songs by biologists Roger Payne and Scott McVay triggered a sea change in public perception. Long considered a "portentous and mysterious monster," as author Herman Melville put it, baleen whales suddenly came across as gentle, intelligent and soulful. Payne and McVay revealed that male humpbacks produce complex vocalizations featuring repeated "themes" that can last up to 30 minutes, which Payne described as an "exuberant, uninterrupted river of sound." With commercial whalers still killing tens of thousands of whales per year — for everything from margarine to cat food — Payne realized the world needed to hear what he was hearing. In 1969 he gave a tape of humpback songs to singer Judy Collins, who included them on her gold 1970 album "Whales and Nightingales." Capitol Records also released the songs that year in an LP, "Songs of the Humpback Whale," which is still the best-selling nature album of all time. Millions of people were captivated, and the songs helped inspire Greenpeace's now-iconic "Save the Whales" campaign. The International Whaling Commission banned commercial hunting of humpbacks in 1966, followed by all baleen whales — some of which also sing — and sperm whales in 1986, a moratorium that still stands today. But while that helped several species dodge extinction, it couldn't undo centuries of slaughter. The global humpback population has grown from 5,000 in 1966 to 60,000 today, but 1.5 million existed before the 19th century. Many other whales have had less success rebounding, including the North Atlantic right whale and the Western Pacific gray whale. And despite the moratorium, a few countries still hunt whales in large numbers, namely Japan, Norway and Iceland. Subtler dangers have also worsened lately, including lost fishing gear that can fatally entangle whales, shipping noise that can disrupt their communication and seismic airguns that can damage their ears. Combined with emerging threats like climate change and ocean acidification, this could jeopardize much of the progress whales have made since the '60s. No whale is more famous for its singing than the humpback. A humpback song consists of vocal sequences that males repeat in complex patterns, mostly while in their breeding grounds (although reports of song chorusing in feeding grounds and migration routes are becoming more common). These patterns can last about 30 minutes, and a male may sing for hours, repeating the song several times. Humpback songs can be heard from as far as 20 miles (32 kilometers) away. All males in a population sing the same song, but those songs change from year to year and vary in different parts of the world. Research has shown a popular song can spread across oceans, starting with larger humpback populations near Australia and gradually being picked up by more easterly whales. At least one song from Pacific humpbacks has even been recorded making it all the way to the Atlantic. While humpbacks get more attention, bowhead whales also produce elaborate, haunting songs. Native to frigid waters in the Arctic Ocean, bowheads have a layer of blubber up to 1.6 feet (50 centimeters) thick as well as a giant, bow-shaped head that helps them break through sea ice. They can live for 200 years, making them the longest-lived mammal on Earth and raising medical interest in their genome. But bowheads have also piqued scientific curiosity with their complex songs, including a 2014 study in the journal Marine Mammal Science. Researchers not only documented 12 unique songs performed by at least 32 whales off Alaska, but they also realized the whales were sharing the songs with each other. Unlike humpbacks, which all sing the same song each migration period, bowheads may be the only whales with such a wide repertoire of shared songs in a single season. Another study, published April 2018 in the journal Biology Letters, revealed the "extreme diversity" of bowhead whales around the island of Spitsbergen in the Svalbard archipelago. Members of the Spitsbergen bowhead population produced 184 different song types over a 3-year period, the researchers found. "It's hard to put into words," study author and University of Washington oceanographer Kate Stafford tells the Seattle Times. "They shriek. They moan. They cry and they rattle and they whistle and they hum." Bowheads were also hunted heavily during the whaling era, reduced from a historic population of about 40,000 individuals to just 3,000 by the 1920s. They have since recovered to between 7,000 and 10,000, though, and scientists think the diversity of songs being sung by bowheads near Alaska might be due to population growth during the 30 years since acoustic monitoring began in the 1980s. Blue whales are the largest-known animal to ever inhabit Earth, growing up to 100 feet (30.5 meters) in length and weighing around 160 tons. A blue whale's heart is the size of a Volkswagen Beetle, helping it pump 10 tons of blood through the body, and its aorta alone is large enough for a human to crawl through. Even newborn blue whales weigh about 30 tons and can add 200 pounds every day. These leviathans are fast, cosmopolitan and tend to stay away from shore, making them difficult for early whaling ships to catch. That eventually changed due to technological advances, though, such as exploding harpoons and steam-powered factory ships. Blue whales once numbered more than 350,000 worldwide, but up to 99 percent were killed during the whaling boom. Current populations are around 5,000 to 10,000 in the Southern Hemisphere and 3,000 to 4,000 in the Northern Hemisphere. The global, open-ocean range of blue whales also makes them tricky to study, but scientists still find ways to eavesdrop on their mysterious songs. Researchers have noticed that blue whale songs are becoming more baritone in recent decades, dropping by half an octave since the 1960s. No one knows why, but it might be a sign their populations are recovering. Some scientists think the whales produced higher-pitched songs when they were scarce to increase the odds of being heard by other whales. Now that blue whales are more abundant, they might be lowering their voices back to their original pitch. 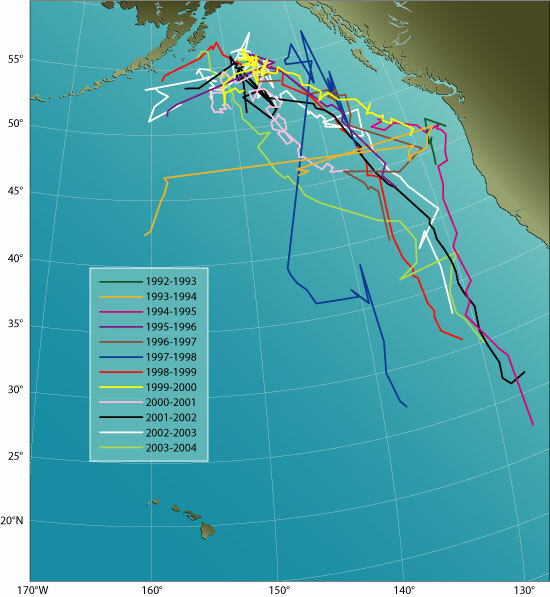 In 1989, a team of biologists from the Woods Hole Oceanographic Institution first detected a strange sound emanating from the North Pacific Ocean. It had the repetitive cadence and other characteristics of a baleen whale call, but it came at a much higher frequency — 52 hertz — than the normal range of 15 to 25 hertz used by the region's blue whales and fin whales. It didn't sound like any known species. Researchers have been hearing the calls ever since, tracking them as the mysterious whale travels back and forth between Alaska's Aleutian Islands and waters off the California coast. The song has deepened slightly over the years, possibly a result of the whale maturing, but its frequency is still too high to draw a response from other whales. This has led to a popular fascination with the 52-hertz whale, also known as "52 Blue" and as "the loneliest whale in the world." Various theories have been floated to explain 52 Blue's odd song, including the possibility the whale is deaf. Whatever the cause, though, it hasn't prevented 52 Blue from feeding, since the whale has lived for at least two decades. But it has seemingly prevented social interaction or mating, leading many people to see the 52-hertz whale as a symbol for loneliness and social exclusion. The whale has inspired albums, children's books, Twitter accounts and tattoos, and it's the subject of an upcoming documentary film titled "52: The Search for the Loneliest Whale in the World." Editor's note: This article has been updated since it was published in January 2015. Why are blue whales changing their songs?